The Frisian islands and the coasts of North-Holland and Friesland are a true “El Dorado” for cyclists. Sailing tours are something special. Feel the freedom and the wind and salt on your skin! It’s a bit like discovering the seas as an explorer. Aboard the Mare fan Fryslân, the Wapen fan Fryslân, and the Leafde fan Fryslân, the most luxurious sailing ships on the IJsselmeer and Wadden Sea, you will enjoy the pure nature of the experience while enjoying water, sun and a stiff breeze. Along the way you can explore a natural area along the coast of the North Sea that is truly unique – the mudflats of the Wadden Sea. It is a world with two faces where sand and water dominate during the changeover from low to high tide and where islands of all sizes line up like pearls on a chain to protect the shoals of the mudflats. This is a place where you can experience pure nature: the sea, the wind and the sun. You can look forward to an adventurous tour. During this tour you will explore the open water of the northern part of Holland’s famous lake IJsselmeer and the adjacent Frisian Sea by sailing ship. 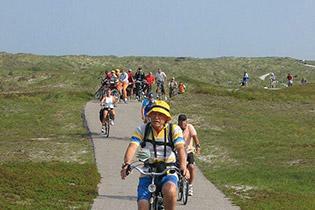 The highlights of the tour are visits to the North Sea islands of Texel and Terschelling and their beautiful natural areas, small villages and long sandy beaches that you can explore by bicycle. The Mare Fan Fryslân was built in 1960 as a freight ship and was then completely renovated in 2006 and has been used since 2007 as a beautiful, almost extravagant, three-mast schooner on at home Dutch waters. On the lower deck there is a saloon with wooden paneling (air-conditioned), also used a the restaurant. Next to the saloon one can find the wheelhouse fitted with bar, music, video equipment and TV. This room is fitted with the large, panoramic window which offers a breathtaking view over the water. On the lower deck there are 12 comfortable 2-bed cabins (floor area of about 10 m2, 2 floor-level single beds 90 x 200 cm), 1 premium twin with a small corner sitting area and a flat screen TV (about 12 m2) as well as a 1-bed cabin with bunk beds (floor area of about 7 m2). In all the 2-bed cabins and the junior-suite is it also possible to arrange to have 3 beds – a Pullman bed/fold-down bed. All cabins have a private shower/WC/sink and ventilation system and portholes which can be opened. The wooden upper deck offers adequate seating, an outdoors bar with a draught beer tap and a grill and even a jacuzzi. The sail can be operated either by hand or electrically. In the harbours there is a Wifi/WLAN connection (free of charge) available throughout the whole ship. On board of this marvellous five star ship you will immediately notice its warm and luxurious atmosphere. On deck there is a the large pilothouse with a cosy and stylish bar and seating area. The panorama windows offer a perfect all around view of the water. The afterdeck has an outdoor cafe with draught beer taps and a jacuzzi and on the middle deck there are various sitting areas. There is room to enjoy a lovely meal outdoors. The sundeck offers plenty of seating including comfortable deckchairs. The large salon, also restaurant, is characterised by its luxurious appearance and flexible furnishing. All 12 spacious cabins (ca. 10 m2) have two separate box spring beds (90x200 m) that can easily be transformed into a double bed. Each hut has its own shower, toilet and washbasin. Each cabin has a folding bed as a third bed which can be used if needed and a porthole which can be opened. The Leafde fan Fryslân, an imposing, three-masted barquentine, will make its maiden voyage for Sail & Bike travel in 2018 and is managed by its owner-operators, Joris and Rinske de Wit. For many years, they have run the Leafde fan Fryslân, a three-masted clipper. 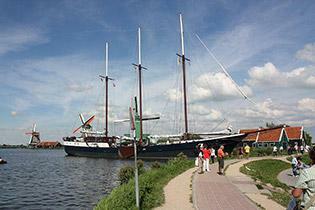 The Leafde fan Fryslân can comfortably carry 25 (maximum 30) guests and is 50 meters (approx. 165 ft.) long and seven meters (approx. 23 ft.) wide with a sail surface of 760 m² (approx. 2,500 sq.ft.). The interior of this luxury ship can best be described as refined. The ship has 12 well-appointed twin cabins with two separate beds (ca. 11 m2), and one single cabin (ca. 7 m2). A third (bunk-)bed can be added in some cabins. All cabins have an en-suite bathroom with shower, basin and toilet. A porthole can be opened in every cabin. Sumptuous meals are carefully prepared in the restaurant and the ship’s full-service, cosy bar is fully stocked. The wheelhouse is equipped with a well-appointed seating area and the best views over the water are available here and on deck.